Escaping to the hills to beat the summer heat, he pens his notes from languid Landour…. On the very first day of my visit, somewhere in the middle of a Landour chakkar — the circular route that loops around the hill station in the shape of the number 8, passing by the Kellogg Memorial and St Paul’s churches, a graveyard and homes with fancy names, ending in ‘glen’ or ‘burn’ or ‘ridge’ or ‘ville’ — I pause for breath. The road is steep, and my city-spoiled lungs and legs are really not used to so much climbing. With hands on waist, panting, I close my eyes and smell the forest all around me. There is a crisp stillness that amplifies the sound of birds chirping. Five minutes later, I open my eyes and realise that I am suddenly in the middle of a moist cloud that has silently floated in and embraced me with such tenderness that I can’t wipe the smile off my face. The monkey on the tree next to me grins approvingly. Welcome to the mountains. Twenty minutes later, at the quaint Emily’s café at Rokeby Manor, Landour’s fanciest hotel, my spoon eases into a toffee pudding and as the hot caramel drizzles down my throat languidly, my smile grows even wider. Landour is a small, sweet slice of heaven on earth. Why in the world have I not visited it earlier? The name Landour is derived from Llanddowror, a Welsh village. The British established the cantonment as a base for a military sanitorium in the hills above Dehradun, and subsequently invited a few maharajas to build their summer holiday homes there. Today, the tiny town counts literary and film royalty as its residents — Bill Aitken, Irwin Allan Sealy, Victor Banerjee and Vishal Bharadwaj to name just a few and of course, the omnipresent big daddy of them all, and his name is Bond…Ruskin Bond. On a caramel high, I make my way to the Prakash store, where the homemade peanut butter is to die for and the preserves are tart and fresh. Following this, I pop in to the neigbouring Landour Bakehouse for some nut brittle. Yes, I live to eat mostly, especially on vacations, and why not? Day one is always about scoping out the food, glorious food! 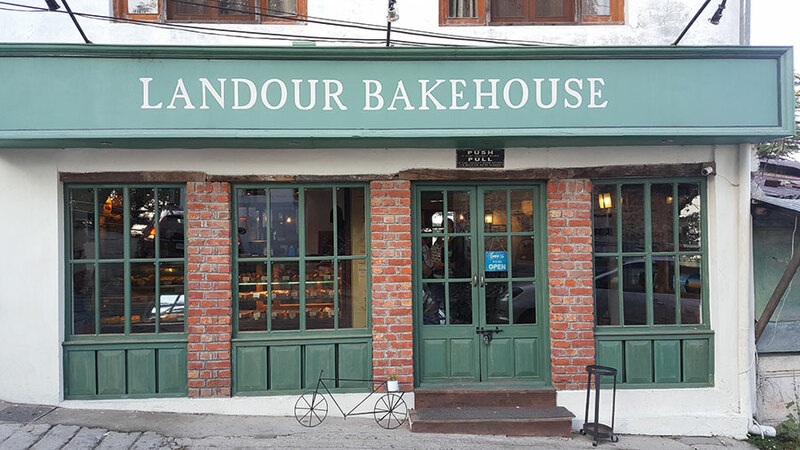 The recipes used at the Bakehouse are taken from the Bond-curated The Landour Cookbook, and are the original recipes of sisters and nuns who were the earliest residents of Landour Raj. The hills below the town have attracted generations of school children. The schools here, including Woodstock, Wynburg-Allen and Doon, are some of the country’s best. But now, this picture-perfect town is being discovered by those in the pursuit of slow luxury. I seem to be late to the party but thankfully, it is not yet a tourist trap, despite it being only about five kilometres and a 1,000 feet above crowded Mussoorie. The majority of the boisterous tourist families from NCR that throng Mussoorie’s Mall Road don’t make it up the hill, and even when they do, it is mostly just up to the Char Dukaan restaurants like Anil’s or Café Ivy. I myself schlep down to Mall Road just once and quickly beat a hasty retreat back up – the only reason to visit the crowded spot is to go to the Cambridge Book Depot where the beloved Mr Bond meets his fans every Saturday, but I have made the mistake of descending on Friday (Note to self #1 — never again). My home during the trip is the aforementioned Rokeby Manor, one of Landour’s landmark buildings. Built in 1840 by British captain G.N. Cauthy, its name is inspired by the Rokeby Castle that Sir Walter Scott wrote about. I’m not staying in the hotel proper, but rather within a cluster of nearby luxury colonial cottages, that are collectively called the the Rokeby Residences. 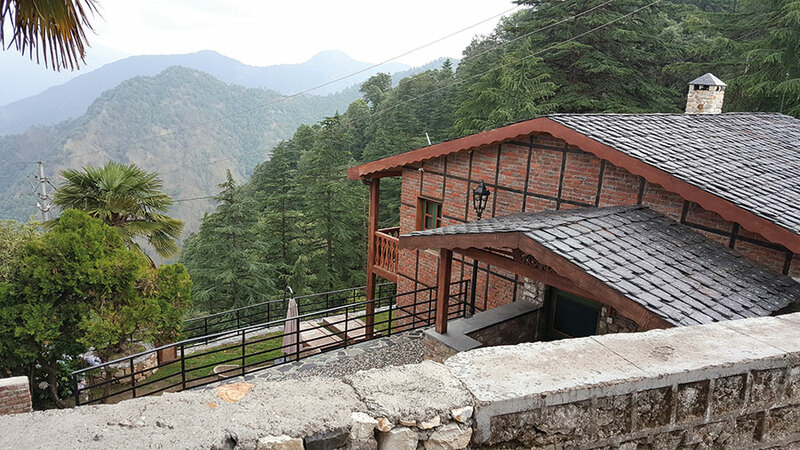 My cottage — Pine Tree Lodge — has stone walls and wooden floors, Scandinavia-inspired interiors and a rather enthusiastic butler who I have to apologetically ask to leave, because I really want to enjoy the spectacular Himalayan view from my porch in solitude. 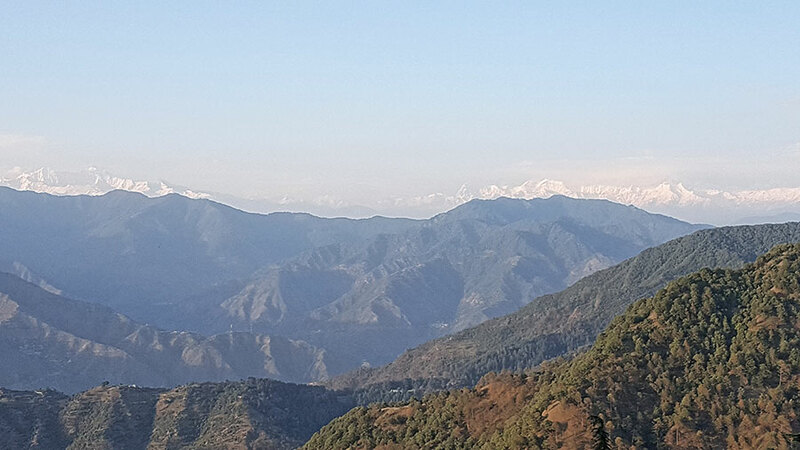 The popular Lal Tibba outpost along the Landour chakkar also has a decent viewing gallery, but I find that the best 200-kilometre view of peaks like Nanda Devi, Kedarnath, and Gangotri is from my bedroom. A cup of steaming hot coffee, a rocking chair, this magnificent view and Confabulations by John Berger in my hand — I don’t think I’ve had a more relaxed holiday in years. Hotelier Sanjay Narang has had a big role to play in raising Landour’s luxury quotient. Sanjay went to school at Woodstock and returned to the town, a few years ago, in style. Since then, he has rapidly bought up a slew of prime properties — including Rokeby, the Landour Bakehouse, the Clock Tower Café down the hill and a few others. Glamorous tales of him abound — the driver who brings me up from Dehradun’s Jolly Grant airport tells me excitedly about the New Year’s eve parties with guests like Sachin Tendulkar — but over my time in Landour, I also hear many tales of Sanjay’s generosity and purposefulness — for instance, of how he has been giving back to his alma mater — by refurbishing the Woodstock canteen and taking over its meal supply. I am delighted to finally visit my friend, author Stephen Alter in his hometown. Stephen’s family is rooted in Landour — his father the Reverend Bob Alter was the principal of Woodstock for ten years. The Alter family home, Oakville, is an institution that everyone, including my butler, knows the directions to. While Stephen manages a prolific writing career alongside a teaching practice and regular treks to the Himalayas, wife Ameeta tells me about how she is deep in the midst of planning a intriguing pottery residence home-stay programme right there at Oakville. I have a lovely dinner with them accompanied by their friends (“everyone knows everyone in this small town”) and dogs — including my favourite, Boston, named after the city in which the Alters spent so many years of their life (Stephen taught at MIT, where I first met him and Ameeta, actually). If you haven’t done so already, you must read Stephen’s book Becoming a Mountain. It chronicles his journey to recovery after he and Ameeta were brutally attacked at their beloved home. You will understand the power of resilience, love and catharsis — all important qualities to have in the turbulent times we exist in. In the book, there is a moment where Stephen — who considers himself an atheist — talks about the healing power of ‘darshan’ when he encounters Nanda Devi after his attack. It is truly moving. 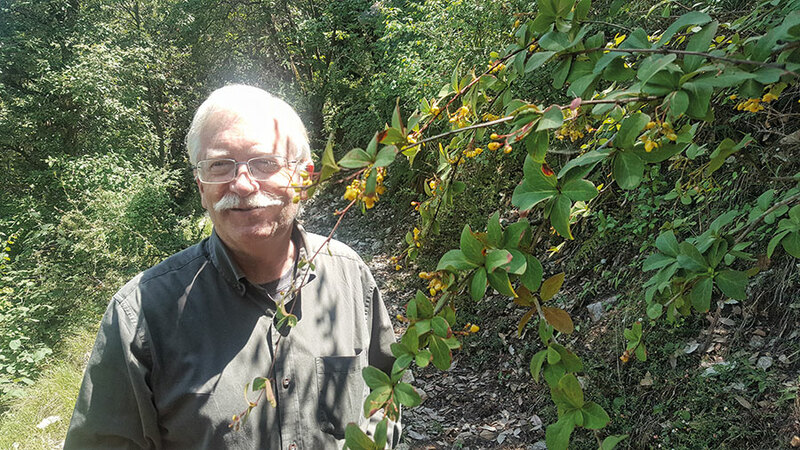 Stephen takes me to Jaberkhet, a private 300-acre nature reserve that has been generously restored after 2013 in collaboration with local villagers. Hundreds of new trees have been planted here, new waterholes have been created, and high-end motion-activated camera traps have been set to record pictures and videos of the wildlife that comes out at night. Gorals, porcupines, leopards, bears — all of these magnificent creatures have been captured by these traps at Jaberkhet. While I wasn’t lucky enough to see any of these, probably because I went during the day and made a lot of noise in my Balenciaga sneakers, (Note to self #2 — pack appropriately next time!) my guide Virendra did manage to show me a noisy woodpecker busy at work, keeping the trees termite-free.